FEBRUARY 9, 2015 – Your Military Occupational Specialty (MOS) will largely define your military career. More often than not, the MOS you select will determine both your prospects as an active duty or reserve member of the armed services as well as your future after transitioning to a civilian career. Choosing your MOS is one of the most important decisions you will make after electing to enlist. Consider these 4 tips for selecting the best MOS for you. Qualifying for your choice of military occupational specialty requires that you present yourself as a valuable recruit for the branch you’ve chosen. The most basic way of proving your worth is by scoring well on the Armed Services Vocational Aptitude Battery. The ASVAB is a written test that will determine your ability to mentally handle the rigors of training and duty. Scoring well on the exam will afford you a wider array of choices when choosing your MOS. To prepare, find an ASVAB study resource online or at your local library. If you have difficulty obtaining a study aid, ask your recruiter for assistance in preparing for the test. On the day of the test, make sure you are well rested and have eaten properly. Take any precaution you need to perform your best on this important preliminary test of your overall fitness. 2. Research MOS fields for which you are qualified. Once you have taken and scored well on your ASVAB exam, review the options available based on your score. Each MOS will have a standard you must meet or exceed before you are able to claim a spot within the field. Your research of the fields you’ve qualified for should include: The location and length of schooling you’ll have to complete, the duty stations that are available for your selected MOS, the prospects for advancement within your chosen field, and the outlook for the related field in the civilian world. 3. Contact current service members in your selected MOS. Getting first-hand knowledge about an MOS you’re considering will be your most valuable insight into the field. Descriptions of the job won’t be able to give you a real-world glimpse into the life of a Soldier, Sailor, Airman, or Marine actually doing the work for a living. You might not have direct access to someone performing the job you’re considering but your recruiter will have avenues for you to contact those who live and breathe your chosen MOS for you to question. 4. Evaluate your choices in the civilian world. 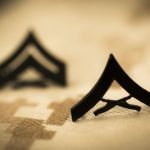 If you plan to enlist as a reservist, you will be transitioning to a civilian career much sooner than an active-duty service member. As such, reservists may choose an MOS with an initial training regimen that will allow for immediate entry into the field. Active-duty members will have the ability to consider schooling and on-the-job training as a combination to land a civilian career once your active-duty service has ended or you transition to reserve status. Either way, weigh your MOS options against the landscape of civilian employment opportunities. You should not only take a snapshot of the employment environment at the time of your enlistment but take a look at Bureau of Labor Statistics projections to see where your chosen field is heading. If 10 or 15 years down the road your selected MOS is forecast to be less available, consider choosing an MOS that has a brighter future. Conversely, an MOS with an equivalent civilian career that is headed for expansion might be a field to which you give stronger consideration. 5. Understand your duty-station options for each MOS you are considering. Your MOS will determine where in the world you are able to be stationed. Choosing an MOS that affords you the greatest chance of being stationed in the type of location you prefer will give you greater flexibility and improve your chance at landing that ideal duty-station. Some jobs are specific to certain regions or types of military installations. For example; an aircraft mechanic will most likely be stationed on a Naval Air Station or carrier, Marine Corps Air Station or carrier, or attached to an Air Force Squadron. On the other hand, a Motor Transport job can take you anywhere service members are found. Be sure not to eliminate your preferred duty-station by selecting an MOS that is unlikely to land you in your ideal spot. Above all, use your resources provided here and through your recruiter to choose an MOS that suits your needs best while you are enlisted and beyond. Certain conditions of your MOS might not be ideal (such as duty-station or opportunities for advancement) but will afford you other benefits that can make it the overall best choice for you. This article was written by Sergeant Michael Volkin, inventor of HIIT the Game, designed to get military recruits fit for basic training. HIIT the Game is now on Kickstarter, check it out! How Do I Join the Military?